So, the party went pretty well. I found myself a nice tux (all black with white tie and hanky... very Mafioso) and got there with time to spare. You won't find any photos of myself. I don't take many photos and since it was my camera... I'd have to put my finger in the way to make it happen. 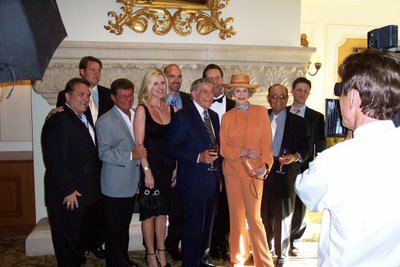 The first picture you will see here (I won't name everyone because I can't) includes (left to right) Rudy Ruettiger, Frankie Avalon, Tony Bennett, Phyllis McGuire and Mike Agassi... ok, Dad is there behind Tony and Phyllis. After taking the first photo, I was standing with my brother Michael (in the second photo on the far right) and this guy walks up and introduces himself. All I heard was the name Rudy but Mike heard the last name and got all giddy. "That's THE Rudy!" I tracked him down a little later and told him I'd love to get a photo of him with my brother... I found out a little later that Michael already made sure that happened. So I opted to get one of Michael, Rudy and my other brother Matt (on left.) 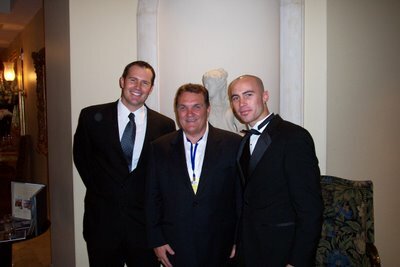 Had a good laugh with Michael about the fact that Andre Agassi's dad Mike was at the event and that if he kept close and quiet to him, people would think he's Andre. 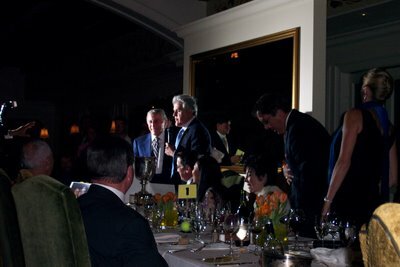 Finally, here is a photo of Jay Leno as he came in to wish Tony an early happy 80th birthday. Jay snuck around the corner with a big cake and said a few words. He stayed for a little while before having to go perform at the Mirage. This preceded the auction which went very well. I believe the whole event raised $200,000 for junior tennis players in Las Vegas. I even wound up purchasing a little piece of artwork from one of the kids in a silent auction. I just don't know where I'm going to put it. Tony Bennet makes me swoon!!!! He may be old, but he's still got it. I wanted to see you in your tux :( You could have asked someone to take a pic. It sure sounds like a big hit...well done you! Awww I was kind of hoping you'd post a picture of you in the tux. I'm sure you looked Mafioso AND handsome. :) Looks like it was a great time for a good cause. Sounds like quite the party! I'm sure that I'll get a copy of the photo that I took with Dad, Matt, Michael, Tony and Frankie. If I get a copy, I'll post it. Promise. Had a good time there and who knows... may go again next year. The best place for mlb apparel,fantasy mlb, 2007 mlb rumor.